Karl’s fiction did not burst fully formed from his head like Athena from the brow of Zeus but was, rather, the product of a long fermentation that began in his chldhood. Among the myriad and uncountable influences that informed his creative impulses were his own experiences in grammar school, at the lake, in high school, within the cloistered walls of Kenyon College and the less sheltering walls of UNC Medical School, his work in the Mental Hospital, his associations with friends and rivals, and, of course his vast reading of the works of numberless authors of fiction and non-fiction. I’ll mention a few of whom I happen to be aware. H. P. Lovecraft, Supernatural Horror in Literature"
Lucy What is it about horror and terror that makes us want to seek it out, to feel the hairs on the back of our neck rise and our blood run cold? Could fear and release of fear be so deeply embedded in our natures that, when life gets too safe and predictable, we begin to crave it? In Man the Hunted Donna Hart and Robert W. Sussman make a convincing case that we did not descend from the fierce, bloodthirsty savages most of us - most men, anyhow - would like to believe. In fact, meat was a very small part of primitive diets, acquired opportunistically; the role of the gatherers - women, as evidenced by the study of primates and primitive cultures - was what kept the tribe alive. Men served as lookouts. Primitive man was not a hunter, he was meat. Hart and Sussman wonder how it was possible for early man to endure the constant stress of predation. Was the joy of eluding death so heady as to compensate? Is that what makes modern humans turn to extreme sports? Or, if we haven’t the time or inclination for that, to horror fiction? If we actually were descended from predators would we still enjoy a good scare? At our core we are food for beasts, and that is food for thought. Red Wull A powerful, red-haired brute, a villain we cannot help admiring, faces down a mob made up of bloodthirsty curs that would not dare look him in the eye without their pack to back them up. Karl and I discovered Red Wull at about the same time in our boyhoods and, again unbeknownst to one another, cheered for Red Wull to put the goody-goody Bob, Son of Battle, in his place. We might also have rooted for Wull’s tormented, complicated and vindictive owner, Adam MacAdam, though I probably gained more insight into my father than Karl did into his all but perfecit sire. That’s the sort of thing great literature does, and part of why it’s important. Karl spoke of Red Wull a number of times. I believe Red Wull laid the ground work for Karl’s appreciation of the Gothic Byronic villains and, ultimately, his own hero-villain Kane. The book by Alfred Ollivant, like Karl’s own books, has long been out of print, but used copies are usually available. It seems a deluxe copy is being printed that will sell for around $90. Robert Simpson Bob wrote a number of scholarly articles on weight-lifting and other topics, but it was not his writing that influenced Karl; it was the man himself. Karl had been getting a lot of flack about Kane’s musculature. It seems a number of pencil-necked readers and authors had scoffed that with 300 pounds of muscle packed onto a six foot frame Kane would be so muscle-bound he’d be barely able to move (“muscle-bound” is a term much favored by decadent city folk with sinews like rotted cloth). Karl presented the example of nimble linebackers, but he was beginning to second guess that aspect of his only series character. Then he met Bob. Bob was a friend of mine and a co-worker, a fellow artist. He was, I think it fair to state, one of the strongest men on earth, especially at his “diminutive” weight of 235 lbs. He could press overhead more than most bodybuilders could bench press. 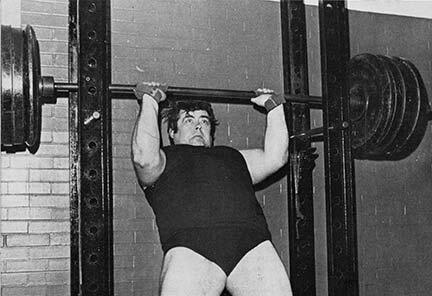 (He’s shown here doing a ”partial” press, lifting 605 pounds from a power rack to arms’ length, though he was reported to have lifted as much as 800 lbs. overhead. I was there when this photo was taken, at the old, manly YMCA, back before it got all yuppified and replaced one of its weight rooms with “spinning” (?). The plates and the lift are real. But what impressed Karl was Bob’s dazzling speed when he demonstrated a martial arts form with a long kukra knife. The blade was visible only as a winding ribbon of fluid steel. It was, in fact, startling to see such a muscular man move so lithely, so accustomed are we to believing that power and agility are mutually exclusive. Thereafter when anyone objected to Kane’s build, Bob Simpson was Karl’s riposte. The 39 Horror Essentials Karl was kind enough to make up a list of the books he thought the best representatives of the horror novel category, divided into three subgenres: supernatural horror, non-supernatural horror, and sci-fi horror. Which of these he’d read before he‘d sold his first novel and which he encountered later I don’t know, but, considering the importance he placed upon them, I think it safe to say that these novels did influence his work. Now, Karl’s tastes may not suit everyone. In high school, for example, he waded through a dozen ponderous Gothic (in the original sense) novels that would have daunted college English lit professors. Happily, now comes Timothy Mayer who has made it his mission to read every one of them and review them for us. You can always trust the judgment of a man named Mayer. S. Clay Wilson This is a stub; I’ll fill in later Karl met Wilson a time or two; they shared a fondness for motorcycles. But long before Karl had taken to quoting the street patois of Wilson’s unsavory characters, and that rough, unvarnished language finds its way into Karl’s stories of historical and prehistoric fantasy; Karl thought ordinary speech a more logical translation of ancient languages than the anachronistic Elizabethan prose that so often found its way into the fantasy tales of other authors. C.L. Moore This is a stub; I’ll fill in later Moore was one of the earliest influences on Karl’s notions of epic adventure. Years before he’d ever heard of Conan Karl was marveling over the adventures of Jirel of Joiry and Northwest Smith. James Branch Cabell This is a stub; I’ll fill in later. One of the most direct influences on Karl’s first attempt at a Kane story, unlikely though it may now seem. The first Kane novel, Bloodstone, originally - I mean, in high school, written in a spiral notebook - echoed the mordant, cynical, worldly wise and ironic style of Jurgen. As I’ve said elsewhere, had Karl not discovered the writings of Robert E. Howard his Kane stories, I think, would have sounded much more like the writing of Jack Vance. Karl Wagner, Master of Horror, Was a Boy Once And though Hallowe’en was his favorite holiday, he was as excited by Christmas as any child of his day. One fanatastic quest that delighted him each year at Christmas time, as it did me, listening to the same broadcasts, though we had not yet met, was that of Judy and Jimmy and The Cinnamon Bear. The 15 minute a day serial, sponsored by the Knoxville Utilities Board and Swan-Smith Laundry and Dry Cleaners, began each year, as far back as we could remember - which wasn’t very far - the day after Thanksgiving, and left us, at the end of each and every episode, on the edge of our chairs or the edge of our carseats on the way home from school, right up until Chrismas eve. We didn’t know anyone had ever shared the adventures of Judy and Jimmy and Paddy O’Cinnamon and the Crazy Quilt Dragon before us, though the show was first broadcast in 1937 and has been aired somewhere every year since. It’s difficult to recapture the thrills of childhood, but many years later, long before most people had any interest in rediscovering the obsolete art of audio drama, I found a reel-to-reel recording of the entire run of the show and Karl and I, and, reluctantly, our dates (one of whom was the future Mrs. Wagner) listened to the entire program at one sitting in the living room of Toad Hall (made famous by its mention in Wagner’s novel Bloodstone). Possibly, I, at least, had managed to chemically restore some of the sense of wonder of my childhood. At the end, when Judy and Jimmy awaken in their chilly attic, their adventure now come to its end, Karl and I had unconsciously risen to our feet and were staring beyond the amplifier at the glowing dial of an old console or the art deco push-button dashboard radio of the family car, devices invisible to our dates who, no doubt delighted to have the marathon session come to an end, must have been perplexed by our emotional reaction. Both of us had lumps in our throats; perhaps one of us even had a tear in his eye. I’m not saying which one. Happily, the original transcriptions of The Cinnamon Bear have been discovered and CD’s of the show are availabe in a much more convenient form than reel-to-reel from First Generation Radio Archives which is a firm, I believe, that offers labors of love rather than commercial products. As their name suggests, their goal is to locate the First Generation of old radio shows and to make those recordings available in the best possible sound. It is for that reason I have permitted them to use my Cinnamon Bear art orignally drawn for a public radio program guide and embellished with color for a quilt by Barbara Webster. I recommend the series highly, with the suggestion that you listen with the ears of a child. Perhaps a real child can asist you in that. Charles Rutledge offers this perceptive discussion of the importance of the great Gothic Novels (not to be confused with the Gothic romances of a later day) on the writing of Karl Wagner and especially on his Kane stories represented by one in particular. Note the spoiler warning if you haven’t yet read “The Gothic Touch.” You can also read this article as well as others on Mr. Rutledge’s blog. Gothic Touches in The Gothic Touch The first Karl Edward Wagner story I ever read was The Gothic Touch. This was a crossover between Wagner's anti-hero Kane and Michael Moorcock's iconic albino, Elric of Melnibone, which appeared in an anthology of Elric stories called Tales of the White Wolf. At the time that I read it, I knew very little about Kane, Wagner, or the Gothic Novels of the eighteenth century. All that would soon change. Like many people who hadn't actually read the Kane books, I assumed he was just another Conan knock-off. The Frank Frazetta covers of the Warner paperbacks did a lot to further this image, showing the usual sword & sorcery images of a big guy in armor fighting demons or just standing there looking dangerous. Reportedly, Wagner wasn't completely pleased with Frazetta's vision of Kane, but a Frazetta cover certainly didn't hurt sales in the mid 1970s. As I began to track down and read the Kane stories though, I soon learned that Kane not only wasn't a Conan clone, he wasn't even a barbarian. He was instead, a staggeringly well read and intelligent man who had traveled his world for centuries and was able to discuss music, poetry, politics, and any number of subjects. He was also a born killer and completely amoral. He was, in fact, the biblical Cain, an immortal who must walk the world until slain by violence. And Kane is darn hard to slay. In his essay, The Once and Future Kane, Karl Edward Wagner discusses the origins of his character. While Wagner admits to admiring and being somewhat influenced by the works of Conan's creator Robert E. Howard, he gives his primary influence as the Gothic Novels of the 1700s. The Gothic genre got its start in 1765 with Horace Walpole's novel, the Castle of Otranto, the book that defined the genre and set up many of its tropes and conventions. It features a gloomy haunted castle, a brooding hero-villain, and much supernatural goings on. The next few years would see the novel become very influential and imitated. The scope of the genre is too wide for me to get into here, but the recognized classics of the genre, what Wagner calls' 'The Standard Four' are Otranto, Mathew Lewis's The Monk(1796), Ann Radcliffe's The Mysteries of Udolpho (1794) and Charles Maturin's Melmoth the Wanderer (which comes in a little late in 1820). It was Maturin's work which would be the biggest influence of the creation of Kane. Wagner says, "If I had to pick the book that shaped Kane into the character he is, it would have to be Melmoth the Wanderer. Melmoth, a doomed wanderer who trails catastrophe and misfortune in his footsteps, immortal so long as he can find another soul willing to sacrifice itself willingly for his sake...I don't know how Kane would have taken shape without Melmoth, but he would be a different character if I hadn't read Maturin." Not that Kane is in any way a copy of Melmoth or the Gothic Wagner's only influence in the development of his writing. Wagner goes on to list many other writers who influenced his work, including C.L. Moore, Poul Anderson, Robert W. Chambers, Manly Wade Wellman, and others. As I noted, at the time that I first read the Kane stories, I wasn't that familiar with the Gothic Novel genre and thus missed a lot of the references Wagner was making. It was reading Jess Nevin's The Encyclopedia of Fantastic Victoriana, with its history of the Gothic and its summaries of the plots of the major Gothics that got me seriously interested in the subject. Once I began to study the genre I began to see what Wagner had been trying for in much of his work. An invaluable resource was The Literary Gothic webpage. (see link at bottom of post) This site has hundreds of articles, stories and links to further reading. Of particular interest was a list of Gothic tropes included with Lilia Melani's 'The Gothic Experience" a course related website from Brooklyn College. * horrifying (or terrifying) events or the threat of such happenings. A castle, ruined or intact, haunted or not. In the first few paragraphs, Elric suggests that he and Moonglum take shelter from pursuing enemies in a nearby ruined castle that is reputed to be haunted. That covers item two as well. Dungeons, underground passages, crypts, and catacombs. After explaining to Elric that he needs his help o recover a treasure fallen from the sky, Kane leads the albino and his sidekick Moonglum into a stairwell that leads into an underground passage and then into a maze of tunnels. They pass through a dungeon torture chamber that is described in loving detail. Shadows, a beam of moonlight in the blackness, a flickering candle, or the only source of light failing. Elric and Moonglum are attacked by weird mutant creatures who knock over Elric's lamp and threaten to do the same to Moonglum's which would leave the two heroes in the dark with the creatures. Extreme landscapes, like rugged mountains, thick forests, or icy wastes, and extreme weather. The ruined castle is located amidst rocky terrain, and a massive thunderstorm rages as the story begins. Omens and ancestral curses. The original inhabitants of the castle are said to have raised a demon to guard the treasure that fell from the sky. Also, the hideous mutant creatures that live underground are thought to be the decedents of survivors of a battle between the castle owners and an army of treasure seekers. Magic, supernatural manifestations, or the suggestion of the supernatural. Hello? It's Elric and Kane. A passion-driven, willful villain-hero or villain. Hello again? It's Kane! A curious heroine with a tendency to faint and a need to be rescued–frequently. Okay, Wagner skipped that one. A hero whose true identity is revealed by the end of the novel. Not his identity so much as his true motives are revealed as we learn that most of what Kane told Elric was a lie. He covered up the extra-terrestrial origins and the true nature of the 'treasure' so that Elric would help him. Horrifying (or terrifying) events or the threat of such happenings. Pretty much from the first paragraph to the last. This is a wonderful story filled with a lot of dark humor as Kane and Elric fence verbally and a lot of sword wielding action as well. I believe that it was the last Kane story that Wagner wrote, and if so, he went out on a high note, using as many of the tropes of a beloved genre as he could work in. There's more than a touch of the Gothic in The Gothic Touch. Now go check out the Literary Gothic web page. Tell em Kane sent you. Webnecromancer’s Note: I can confirm that Conan was not a major influence on the creation of Kane. More likely Howard's spare style is in evidence in the Kane stories more than are the essential elements of his approach to epic fantasy. In fact, Karl had already written versions of two Kane stories before he ever even heard of Conan. I know this to be true because I am the one that discovered Conan and introduced Karl to the character. This was an unlikely circumstance as Karl was already collecting and reading old pulps including Weird Tales and out of print books from Arkham and other publishers, long before I was, saving and spending his lunch money on them (lunch money would hardly suffice for the least of them today). I recalled he was especially fond of Moore's characters Jirel of Joiry and Northwest Smith. But neither he nor I had ever heard of Conan. If this seems remarkable, remember that in my boyhood there was only one place in Knoxville where my family could find the exotic culinary treat pizza (pronounced PEETza). I actually came upon our first Conan story while rummaging through Doc Black‘s New and Used Bookstore (a delightful place for boyish fans of ghosts and the occult; he also operated a costume shop upstairs where I often bought elaborate, frightening masks for no real reason). Somewhere, behind some books or behind a shelf, somewhere that had eluded the previous quests of Karl and myself, I found a copy of, I think, Other Worlds. In it was the Conan story "The Black Stranger." I read it and then gave the magazine to Karl, remarking that he might find the Conan tale of particular interest. One of the things that appealed to us about it was the fact that Conan not only didn't have any magic accoutrements, he had nothing at all but a knife and his indomitable will. I believe this story had already been altered by L. Sprague de Camp and had been published after Howard's death, or, perhaps, republished. But it was mostly Howard and we were impressed. Karl was working on his second Kane story at the time, "The Treasure of Lynortis," I believe (many years later drastically revised and published under a slightly different title well after Kane was already a well-known fantasy figure). His original inspiration was, no doubt, Melmoth, but the tone of his writing at that time owed most to James Branch Cabell and, particularly, Jurgen. There was a wry humor and sophisticated (certainly by the standards of a small-town boy in his mid-teens) wordplay in the writing that Karl largely abandoned after reading Conan (not necessarily cause and effect). Had I not come upon that magazine the Kane stories might well have ended up sounding more like Jack Vance than like Robert E. Howard. Ultimately, I honestly believe, they sound like only Karl Edward Wagner.